NOW AVAILABLE IN TWO CASE STYLES and TWO SOUND STYLES: PLEASE SELECT YOUR STYLE CAREFULLY! REGULAR CASE STYLE - Hard plastic cassette case with full cover and printed label. OLD CASE STYLE - Soft plastic cassette case with front and back stickers made from image when cassettes were made by hand. Daniel's early song-writing years were characterized by his individually hand-made cassette tapes which he made and handed out to friends and strangers. He use the cheapest tapes he could buy, and even subscribed to free-by-mail subscriptions to denominational preachers just so he could re-use the cassette tapes. Some of the preaching on those tapes later were kept on the albums he created! 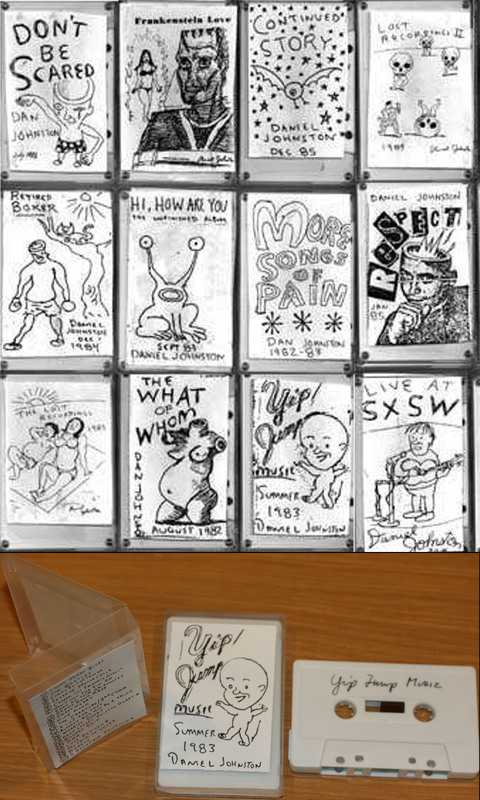 Jeff Tartakov and Stress Records then continued the tradition of hand made / hand copied cassette tapes for decades. Albums vary in content and length, so some vary in price. You should be aware that the CD versions of several of these albums come as a COMBINED tracks from several albums, so the asterisked albums have fewer tracks than the CD versions. 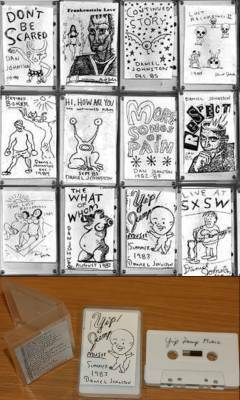 The album Live In Berlin, however, contains ALL the tracks from the 1999 Berlin show, which is more tracks than the original cassette tape release, and the same number of tracks as the CD release titled "Why Me - Daniel Johnston Live In Berlin". The CD version of Songs of Pain and More Songs of Pain is titled "Early Recordings" and contains 2 CDs. The double asterisked tapes on not available on any CDs.